As he looked through the small hole, Carter was at first unable to distinguish specific objects, because the pale light cast off by the candle flickered constantly. But he soon realized that he was looking, not at wall paintings, but at three-dimensional objects. They appeared to be enormous gold bars stacked against the wall opposite the entrance. Dumb-founded, and transfixed, he just stood there muttering, "wonderful, marvelous, my God, wonderful". In 1997, special events in Luxor marked the 75th anniversary of this remarkable event. One of the highlights was the opening of the Howard Carter house on the west bank of the River Nile, where the famous British archaeologist stayed during excavations in the Valley of the Kings situated not far from the tomb itself. Tutankhamun is undoubtedly one of the most famous rulers of Ancient Egypt, but as Howard Carter noted: "We might say with truth that the one outstanding feature of his life was that he died and was buried". More is known about him in death than in life. His tomb was discovered nearly intact, with a breathtaking 5,000 items crammed inside, ranging from gilt chariots, couches and chairs, to chests, statues, pottery, alabaster and gold. 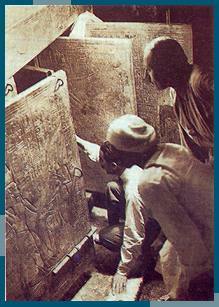 The story of the discovery dates back to 1917, when Howard Carter, a monuments inspector, was supervising excavations begun by Theodore Davis, a rich American patron of archaeology who held the concession to excavate in the Valley of the Kings until 1914, marking many notable discoveries. As soon as Davis relinquished the concession, Lord Carnarvon, who was working with Carter at the mortuary temple of Queen Hatshepsut in the Deir EI-Bahri area, took over and became sponsor of the expedition for Carter. For six fruitless seasons, Carter searched for the tomb of the young Pharaoh. But in their last year, just as they were about to give up all hope of ever finding anything, and workers' huts were being removed on the morning of 4 November 1922, an Egyptian worker came with good news: a tomb had been found. On 6 November, Carter sent his historic cable to Lord Carnarvon telling him about the discovery, and on November 24 they went together with Lord Carnarvon's daughter to unseal the doors of the tomb - and the rest, quite literally, is history. Ever since its discovery, people from all over the world have been fascinated by the treasures of the young Pharaoh, which still have an almost magnetic attraction for visitors of the Egyptian Museum in Cairo. Encouraged by this global interest, officials decided to organise the famous exhibition "Treasures of Tutankhamun" that travelled outside Egypt to Paris in 1967, the British Museum in 1972, to four cities in the Soviet Union in 1973, and to seven in the USA. encouraging the late Egyptologist Labib Habachi to comment "Tutankhamun has been one of Egypt's greatest ambassadors!" However, the tomb itself, like many others in the necropolis, has been subjected to various forms of damage over the years. The Valley of the Kings is known to have suffered from floods and earthquakes. More recently humidity and the effects of mass tourism are having a detrimental effect on the area. Concerned about the condition of the tomb, the Getty Institute devised a scheme in 1992 to save the tomb. During the same year, the Egyptian government announced a 5-year project, with experts from the Institute and in the Supreme Council of Antiquities (SCA) spending up to 18 months studying the tomb's wall painting and comparing their current state with photographs taken when the tomb was first opened. The next 18 months were to be spent treating the painting to try to slow down the deterioration. The team would then continue to monitor the tomb, for perhaps a further two years, before any decision was made on whether to allow it to be opened to tourists. This 5-year plan remained just that - a plan. The unique tomb "has been open to tourists from all over the world from 6 am to 6 pm," said Mohamed EI-Saghir, Head of Antiquities in Upper Egypt, who believes that "the tomb does not need restoration; there is continual checking and inspection on the part of the SCA. Like other tombs in the valley, glass has been installed on the walls to prevent touching, and wooden floors have been installed to prevent dust from rising." 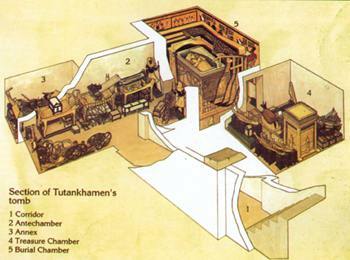 Some years ago a suggestion was made to build a replica of Tutankhamun's tomb on the necropolis, but after months of discussion at various levels, the idea was shelved, the argument being that tourists come all the way to Egypt to see the real thing not a replica. However, an imitation of the tomb has been reconstructed a few kilometers south of Cairo in Dr Ragab's Pharaonic Village, complete with replicas of its contents, based on photographs and documentary evidence of the tomb as it was when first opened. The fascination and mystique that has surrounded the boy king since 1922 look set to continue well into this millennium. In its Structure and decorations, the tomb is one of the least impressive. It is the immense treasures of art and archaeology it has yielded, that have made it the most famous. The tomb, discovered in the early part of the 1900's, had been hastily prepared for a Pharaoh of secondary importance, who died earlier. The only room to be decorated was the burial chamber, one story says. The decorations show Ay, the second husband of Nefertiti and successor to Tutankamun, performing the "opening of the eyes and mouth" ceremony on the mummy in the guise of Osiris. The tomb had no sooner been filled with its furnishings and sealed than it was "visited" by the thieves. They were evidently disturbed and succeeded in making off with only a few objects. Summarily redecorated and sealed anew by the priests, it was buried a hundred years later by debris when the tomb of Ramses IX was built higher up. The waste material cancelled all traces and it was forgotten for 3000 years, until it was brought back to light in 1922 thanks to Howard Carter's experience and intuition. The discovery of the tomb in a valley that had already been thoroughly 'excavated' brought the archaelogist great fame, but also the bitter realization of just how much had been lost to mankind when the tombs of Pharaohs as great as Amenophis III, Seti I, Ramses II and Ramses III were looted. The treasures found are now in the Cairo Museum.